When talking about stickers, people may think of a gold star for acing a spelling test in elementary school. Surprisingly enough, there are quite a few applications that stickers provide in everyday situations. Stickers can be customized with a company logo, placed on cars, and can be created in nearly any size, small or large. They can be used in a variety of ways such as promotional giveaways, advertisement, and special events. Here are some of the ways custom stickers can be used. Promotions – A custom sticker with your business logo can be given as free swag at a storefront, trade-show, and special events. Window Decals – Are an easy way to convey information such as store hours, social media information, business name, and much more. Bumper Stickers – How many times have we read a bumper sticker while in traffic? Bumper stickers are an easy way to advertise your company. Address Labels – Printing envelopes with branding and contact information can be tedious. Address label stickers are fast, affordable, and easy to peel and stick on. Sellable Items – Products and sellable items require barcodes and labels so it can be rung up at the register. Inventory – Keeping an accurate inventory of your products is key and stickers can be customized with a barcode so they can scan easily when performing inventory counts. Wall Graphics – Have your walls do the talking and put up a custom wall sticker. Best of all, they are easy to put up and take down. Floor Decals – Floors are an underutilized space and can be used to advertise and promote. Packaging – Shipping an item with a logo, or product information is an easy task with custom stickers. Custom decorations for special occasions like weddings, quinceaneras, and corporate events can add to the atmosphere and help create long-lasting memories. One way to have your event stand out is the utilization of wall and floor stickers. They can be specially designed with a graphic, or logo of your choice. Wall and floor stickers are easy to apply and remove, which makes event breakdowns easier. Floor stickers are also resistant to footprints and scratches so guests can dance on them without scuffing up the graphic. Whether it’s for business purposes or special event decoration, custom stickers have many uses and applications. They are great marketing tools and are practical for labeling and organizing product. Bombshell Graphics creates custom graphics and design in Boston, New Jersey, Connecticut, Delaware, Hartford, Long Island, Massachusetts, New York, Pennsylvania, Philadelphia, Rhode Island, Virginia, Washington DC, Westchester, and nearby areas. 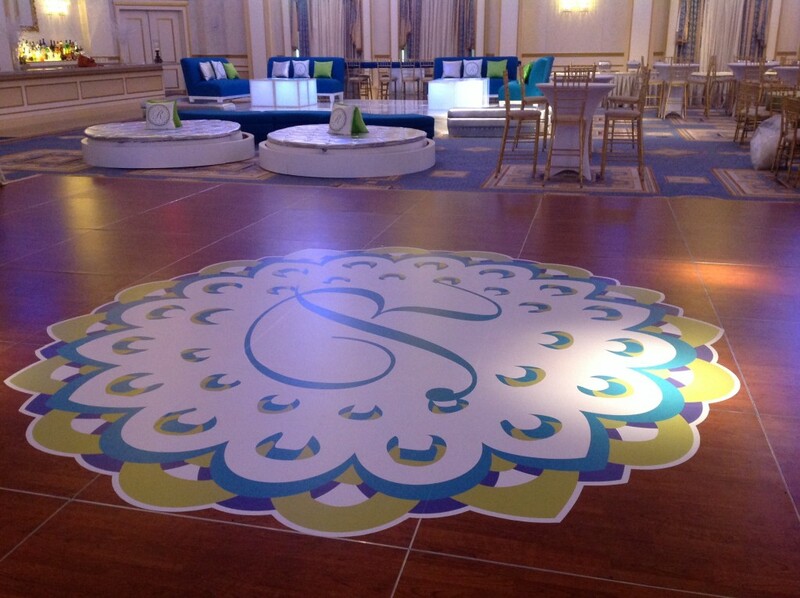 Our services range from custom floor graphics, sign and banner creation, event decor and more. Contact us at 862-210-8408 for a quote today!